Whenever the topic of accessibility, specifically screen readers, comes up, I always hear, “Just write the markup in a semantic way and it’ll be fine.” Why do we say that? Because the whole field of accessibility stuff is so broad and dense that we want to write it off. Is it true though? Can just semantic markup cover it? I care, but I can’t change my title to Accessibility Wizard and spend hours and hours casting spells and reading obscure tomes to figure out how to make my sites perfectly accessible. In trying to answer that question, I decided to start in the obvious place, forms. First things first, how am I going to try this out with a screen reader? How will I test if what I do is an improvement or not? So here are my choices. The top choice for me to check out would be JAWS, obviously, but as I’m on a Mac, and it’s Windows only, its out. Number two is NVDA, but same story there, Windows only. I have no choice but to use the third highest, which happens to be the Mac VoiceOver. At 37% its still highly relevant and will do for this experiment. What happens when VoiceOver reads over this? It reads it this way because of the for attributes that pair the labels to the ids. This seems fine so far, right? 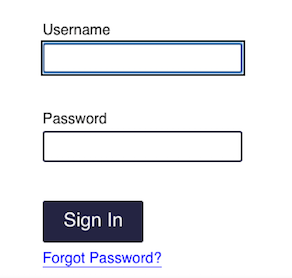 Its reading the label so that the user has some context, and tells them when they can type. 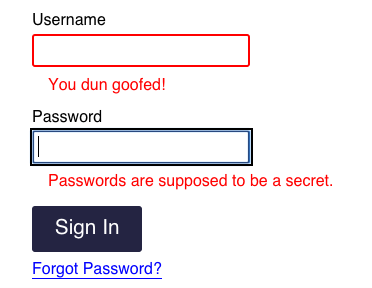 It even says ‘secure’ on the password field. So it isn’t indicating that there’s something wrong at all. What I’d like to have happen is that there would be some kind of message, when the field is focused into, that it’s not right. Even better, read to the user why it’s not right. 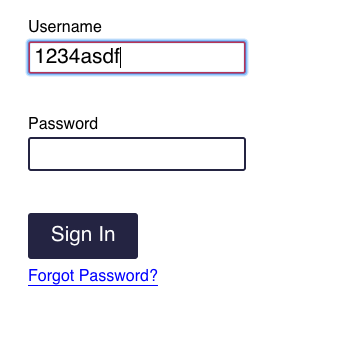 That’s much better because now the user can tell which field has the mistake in it. What about WHY its invalid? Another thing that’d be nice to have is, if, when the field is invalid, VoiceOver read what was actually wrong with it. Which is all well and good, but where’s my validation message? That’s helpful. Is it what users expect from this kind of thing? No clue. It makes sense though, if the help text is usually read in that way and they already know that the field is wrong, it stands to reason that they will linger for a clue as to how to fix it, which is what we give them. Yeah, this is all I have so far, but there’s nothing here that should slow one of us down for long enough to make it not worth doing. Especially if we care about an open web for everyone. P.S. If I’m missing anything easy here or you want to send similarly easy things to do to improve accessibility on a website, please do.